If you have ever seen a space shuttle launch–and let’s pause for a moment of silence for NASA’s funding—you remember how small the shuttle itself looks on the launch pad. Even though it’s a massive vehicle, it’s dwarfed by the fuel tanks that will boost it into orbit. It takes a lot of energy to defy gravity, and the shuttle needs all the help it can get. For marketers, influencers are the fuel that can get our content out of the gravity well and up where people can see it. We know influencer marketing gets results, and it’s great to see it emerging as a trend. Eighty-four percent of marketing and communications worldwide expect to launch at least one influencer marketing campaign in the next year, and 81% who have already tried it say influencer engagement was effective. 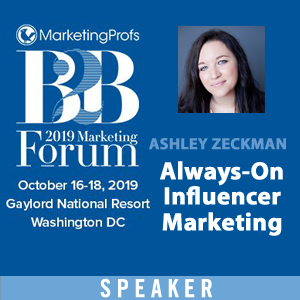 Influencer marketing is one of TopRank Marketing’s specialties. 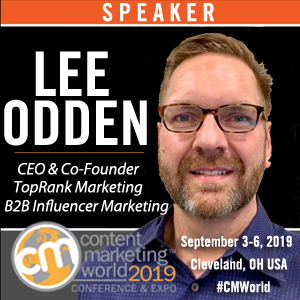 Our CEO, Lee Odden, has presented on the subject at Content Marketing World, PRSA, InBound, and many other industry events. And we strive to share what we know with our dedicated TopRank Marketing Blog readers. The following five posts are our most shared influencer marketing posts in 2015. We hope they inspire you to start your own influencer marketing program, or optimize the one you already have. Lee leads the pack with this case study of our Killer Content Award-winning campaign for Content Marketing World in 2014. He details the tools we use, and gives a quick overview of our process for identifying influencers and integrating their contributions into content. 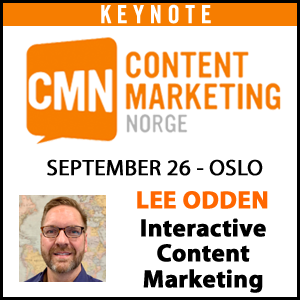 As a bonus, Lee links to over a dozen additional influencer marketing resources at the end. At TopRank Marketing, we work hard to do influencer marketing right. Which means we have identified, either by making mistakes or seeing where others have failed, plenty of ways to do it wrong. Lee rounds up the surefire ways to fail at influencer engagement. Learn from our and other marketers’ mistakes, and go forth to make your own on the way to greatness. Influencer co-creation isn’t limited to eBooks, or white papers, or guest blogs. Director of Agency Marketing Ashley Zeckman presents three unique case studies in this article, showing how influencers can spice up virtually any kind of content. Spoiler alert: The difference is that brandividuals are popular, but influencers create popularity. They are two very distinct groups, each of which have a different function for influencer marketing. Lee explains the purpose each serve, and the value of a third type of influencer: someone who is not yet influential, but can become so with the right creative push. 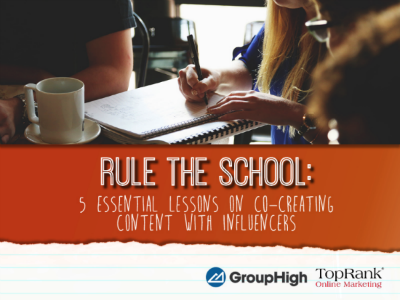 This past fall, TopRank Marketing partnered with GroupHigh to create a seriously cool, totally meta influencer marketing eBook. It’s an instruction manual on influencer marketing, but it’s also an example of influencer marketing, featuring contributions from marketing luminaries like SAP’s Celia Brown, LinkedIn Marketing Solutions’ Jason Miller, and Xerox VP of Marketing Jeannine Rossignol. This blog post introduces the eBook and includes some tasty tweetable quotes. Our client LinkedIn Marketing Solutions brought in bestselling author Brian Solis and renowned cartoonist Hugh MacLeod for this eBook. The result is a heartfelt, emotionally affecting piece that allows LMS to express their core values in an innovative way. Our colleagues (and sometime partners) at the Content Marketing Institute pulled out the big guns for this collection of predictions. They went above and beyond the usual oracular blog post, lining up 40 influencers—including Lee—for this fun, well-designed, aggressively orange SlideShare currently at 45,000+ views. LeadMD came out swinging with this big rock (pun intended), featuring rock star marketers across the industry. The campaign’s theme is fun, their promotion strategy was solid, and the content itself is high-quality stuff. Thanks to our outstanding blogging team for their great work on these posts. And thanks to our readers for reading, commenting and sharing. We’ll use your feedback to make the blog an even better resource in 2016. Are there any posts you loved that didn’t make the list? Are there any questions about influencer marketing we can answer for you? Let us know in the comments, or contact us directly.